As insignificant as they may seem in your everyday hustle and bustle, the window and door hardware in your home remains a considerable part of your activity each day. In most cases, no matter how often we use our doors and windows, these accessories become most noticeable when they fail to function properly. For the most part, when it comes to window and door hardware, the basics remain the same. There are handles, faceplates, latches, knobs and locks — all of which must look good, function properly and accentuate the feel of your home. While the basics do not change, the style, function, security and technology options continue to make significant strides every few years. SAHR Building Supply offers everything you need to customize the hardware on the doors and windows of your home. Whether you’re looking for added security, improved aesthetics or just replacing broken parts — we have the right hardware for you. We understand that your home allows you to express yourself, and designing it in your own unique way sets you apart. 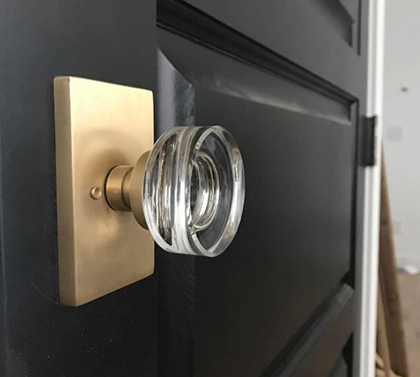 Putting your accents on your doors and windows by customizing the handles, knobs or locks to fit a certain aesthetic is a great way to show your personality and impress guests. From doorknobs to window latches, to locks and hardware, you'll find something to complement your home's unique style and security needs. Each hardware set is easily customizable to meet your style and security needs, or you can pick from a wide-variety of pre-fit options: knob, handle or push plate, programmable keyless entry, in nickel or bronze. We guarantee that if you need it, we can find it or make it and install it properly. For more information about residential window and door hardware from SAHR Building Supply, please contact us here or call us directly at 855.724.7934.